Install Manager provides the ability to work in either an online or offline mode. While working in the online mode, Install Manager presents you with a list of available downloads and/or updates for your account. It allows you to selectively download all of the items in the list, specific items in the list or each item individually. You also have the option of automatically installing items in the list after it has finished downloading. This document will walk you through all the options so you can decide how best to fit them into your content management pipeline. In order to download content from your DAZ 3D store account, you must have Install Manager installed and have your account associated, as well as your download location mapped. If you need help with either of these, please check the User Guide. The Install Manager has a great deal of advanced options as well. We will cover the basics here. To get more in-depth usage, please see the Reference Guide. When working offline, the list on the Ready to Download Page is empty - the application must connect to the DAZ 3D store to retrieve the list of available downloads for an account. When working online, this page provides you with a list of all products and/or updates that are ready for download, for the account that you are currently signed in to. Open Install Manager and choose your account from the drop-down selection. Install Manager will now open to the “Ready to Download” pane. Once it has retrieved a list of products waiting to be downloaded, you will have several options. 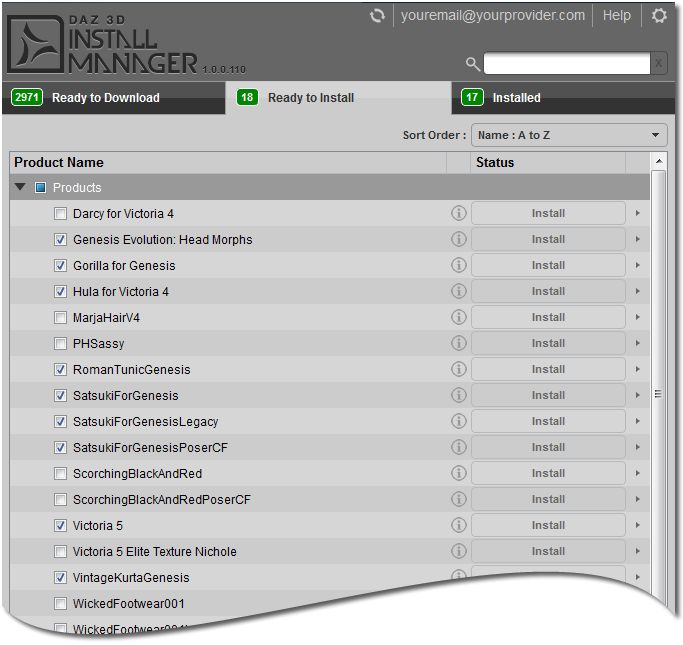 This image shows you a “Ready to Download” screen populated with the files waiting in our account. 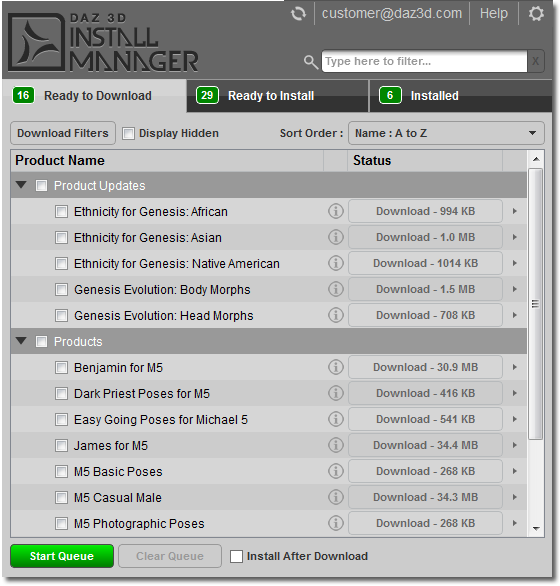 You are able to see the Product Name and can tell immediately if the file is new and waiting for Download, or if it is an Update as seen with “Ethnicity” and “Evolution” morphs in our example. If you are logged in, and have no files listed, this means you have nothing new to download. If you are sure you have new files, make sure you are logged in to the correct account, and that you are not “Working Offline”. Also make sure you are showing any files you may have hidden. The “Display Hidden” box should be checked if you have hidden files and wish to see them. There are several advanced options for viewing and managing files in the Right-click context menus. Please refer to the Reference Guide for more information on these features. Download All Files - Check the “Product Updates” or “Products” boxes and all your files will be selected under each header. Click “Start Queue”. Download Selected Files - This is the same, but instead, individually select the files you want to download. This is good if you run multiple programs and want to download to separate locations. Again, click the “Start Queue” once you have made your choices. Download One File at a Time - To download a single file in the list, you can click the “Download” button to the right of the file you want to download. Install after Download - If this check box is ticked, anything you download will install immediately after download. The files will install to the location you have set in “Settings”, so if you have multiple locations, make sure you have the correct one selected before choosing this option. View the Product Documentation - You can view a product's online documentation at any time by clicking the “i” to the far right of the Product Name. Clear Queue - You can clear your selections at any time by clicking the Clear Queue button. Checking the “Install After Download” box will do exactly that. As soon as the Zip is downloaded it will install to the currently selected location. This goes on even if you are still downloading other files. If you want to install files to different locations, make sure to Uncheck this box! Download Size: Largest First - Largest Zip size, in descending order. Download Size: Smallest First - Smallest Zip size, in ascending order. Download Date: Recent First - Newest downloaded, in descending order. Download Date: Oldest First - Oldest downloaded, in ascending order. You can do the same thing using the SKU number to find a particular product. Just put the number, for example, sku::12356 (or a range of numbers sku::12350-14350) in the Filter Field. Please see: Advanced Filtering for more advanced filtering options. This is all that is required for accessing and retrieving files from your account. Installing files is very similar. When you are ready, please read Installing With Install Manager (WIP) for more help and information.